There's a big stabbing pain in my neck... I'm okay though. Sure it hurts, but it's not debilitating or anything. I wonder if I just don't have a severe case of it? Or maybe I have a high tolerance for pain? Could be the high tolerance thing. Speaking of high tolerance for pain and pains in the neck, that makes me think of my little brother Stephen (pronounced "steh-fun"). So I guess I should thank him for training me to be tough or something. Too bad he doesn't have a blog so I could send all of y'all there to harass him. I am very thankful that he turned out to be a pretty cool little brother-- although that didn't happen until he was almost 18 years old! 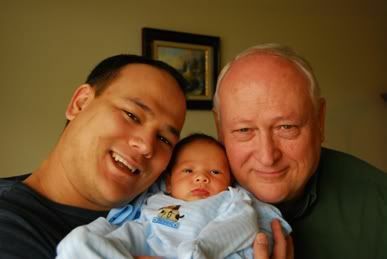 Now he's a man and all-- husband to Terri AND father to my cutie-patootie nephew Caden (who is much fatter, rounder, noisier and busier now than he is in this picture). You turned out pretty good for a punk of a little brother, Stephen! I guess I should cut you some slack though for being the only boy with 4 sisters. You can't exactly survive that and be completely "normal". And my daddy up there? Yup, he is O-ficially re-tired! Congrats, daddy! My mom and dad have been spending their hours of free time on the Wii. They totally *heart* Wii Golf. So much so that my mom can use the terms par, bogey and birdy correctly! That's just weird, y'all. How do YOU choose a shampoo? Are you swayed by commercials? Would you NOT buy a particular shampoo b/c the commercial or ad campaign is completely annoying a la Herbal Essences? Do you choose one strictly for its smell/scent? Do you still hold out hope that the claims on the packaging will be true? What is your favorite shampoo/conditioner of all time? I'm always looking for new shampoo. Probably b/c I'm a sucker for the claims on the bottle. Tonight I bought a new kind by Aveeno. I like their other products so I thought I'd give it a go!